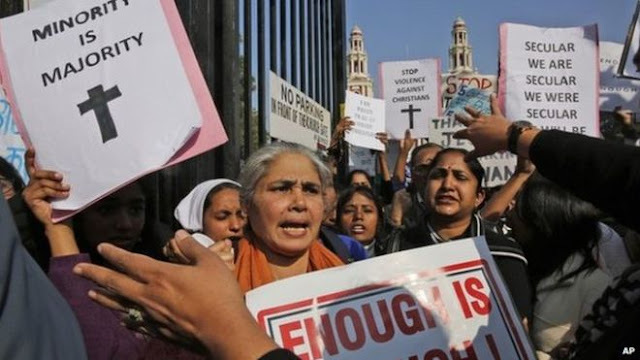 National Alliance of People’s Movements expresses deep shock at the unprovoked violence against Christian priests and seminarians in Satna in the Central Indian state of Madhya Pradesh on the night of December 14, 2017. A group of people hailing from Bajrang Dal attacked a group of 30 Seminarians and two Priests of St. Ephrem’s Theological College as they were conducting a routine Christmas carol singing programme which has been the practice during the Christmas season for the last 30 years. The group came with lathis and started threatening the Priests and Seminarians. Just then they called the police, who arrived in just 15 minutes and taken all Priests and Seminarians to the police station. It is very shameful that during the celebrations, not even the police restricted them of their freedom of religious celebrations but also tortured them by putting all of them in a room which cannot accommodate even half of them. Later when other priests from nearby villages came to enquire, the police allegedly beaten them up and shamelessly acted against the spirit of constitution, leaving Bajrang Dal people untouched and free to do violence inside and outside the police station. They even torched vehicles of priests and beaten up in front of police officials which only proves their involvement in the alleged planned attack and harassment of religious minorities in the garb of prevention from religious conversions. This is not standalone case but we are seeing this as a trend under the rule of current Government. In most of the BJP ruled states, it has seen a rise in the last three years. Only in Madhya Pradesh, a dozen of incidents happened in the past giving a strong indication of religious attacks by Hindutva groups maligning the secular fabric of the country and constitutional rights of citizens of India. It is worrying that this incident of mobocracy occurs among a host of other incidents around the country. The video clipping of the gruesome murder of Mohammad Afrazul, a migrant worker from West Bengal who was hacked with a cleaver and then set on fire by a man in Rajasmand, Rajasthan on the suspicion of being in a relationship with a woman from another religious faith has gone viral and many Hindutva groups are being proud of the act and also unfurled the flag on Udaipur session court. Lynchings of more than 32 persons over the last two years almost all from one minority community on the suspicion of killing a cow or possessing beef is creating a fear psychosis among the minorities. These acts of Cow vigilantes do not being credit to our democratic nation with its long tradition of being the model of civilized living and harmonious existence in comparison to some other countries in neighbourhood.